When I entered the church I went straight to Our Blessed Mother to ask for her intercession, that she would pray that the Lord allow me to rest my head on His breast. I believe she did. Then I passed the altar on my way to the chapel and caught a glimpse of Jesus on the cross—which I often forget about since it is off to the side giving the premier spot front-and-center to the Risen Christ. I don’t think I’ve really adored the cross very many times and I actually found it rather difficult to keep my eyes focused on Our Crucified Lord, in His pain, His agony, His suffering. But eventually I found myself in profound adoration of Our Lord on the cross. 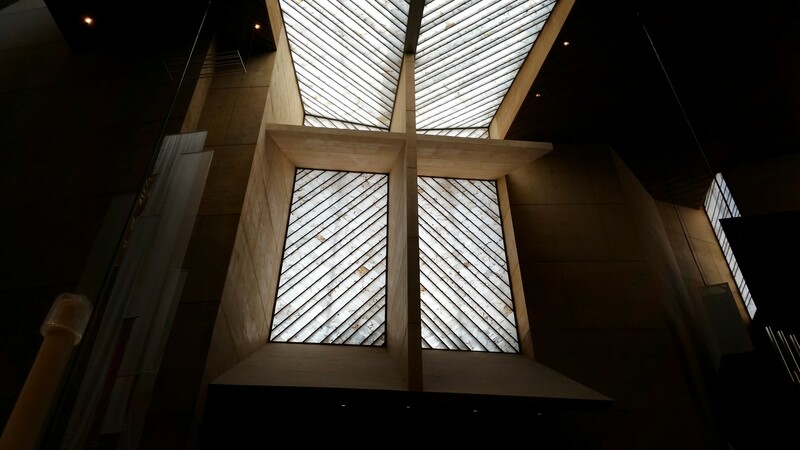 It was as if looking up at the wooden statue I was transported to the time and place of the crucifixion. It felt real in a sense—something I can’t say I’ve ever experienced in this context. It really meant something to me. After that it was the Lord’s time to talk. I made my way to the chapel and knelt before the tabernacle. In my thoughts I heard Him speaking to me—I perceived His voice amidst my own thoughts and was consciously aware of what He was saying to me. He showed me that I too was called to the cross. I am being called to die to myself, to my pride; to give myself to God, to put my life in His hands, to give my life away for others. Contrary to common belief, suffering is an essential part of the Christian life, just look at the example of Jesus Christ, of whom we are faithful followers. In many of the recent circumstances I’ve found myself in I’ve become aware that I am dealing with rejection, because I have to learn to set my pride aside and die. I am being called to lead in various roles—coaxing my ego out of its hiding place where it just hates to be, which takes alot for me to keep in check. I am facing responsibilities that I’d never have imagined—blessings in disguise and opportunities to be a good steward. He has shown me that only through the cross comes the joy of life and the life of joy. There is a reason that Catholics don’t take Jesus off of the cross. You can’t get to the resurrection without first going through the cross. And that’s where Jesus is taking me, to the cross. I remember a few weeks back a homeless man asked me for money as I was coming away from the ATM—of course, I couldn’t say I didn’t have any cash. So I gave him what I could and he noticed the crucifix around my neck. His first reaction was: “Oh, are you Catholic?” I affirmed and he responded: “Well, you know Jesus ain’t on the cross anymore?” We agreed and the celebration of Easter and the Resurrection of Christ came up, but the reason I bring it up is because I think it’s dangerous for us to lose sight of the cross. Yes, it’s true, as Christians we are an Easter people. We believe that Christ is alive. Aleluia! But, He is alive, because He died. He rose from the dead, because He submitted to the crucifixion. It’s an example of selfless love, the supreme example of selfless love. We can’t forget it. We can’t hide the cross back in some corner of our hearts, we have to live the cross, and not just the cross, but the passion, death, and resurrection, and not just once-a-year, but every day of our lives. The cross is scary, I realized that when I couldn’t keep my eyes on it. But the cross is calling me, perhaps in different ways than it is calling you, however it is calling all the same. Attended first retreat in June 2010. A convert to Catholicism, Ricky came into the Church in 2008 and has been on fire ever since, having served as a catechist and parish leader. He blogs about faith at LeadersThatFollow.com. He is the author of Seven Lessons in Leading People to Life Change, a practical guide for living your faith, leading people into relationship with God, and building up the Church. Together with his wife Johana he founded The ROCK Association a 501(c)3 non-profit organization that has as its mission providing resources, training, and the construction of buildings for the the purposes of faith formation. They are currently building a convent in Tanzania, but they make their home in sunny Los Angeles, California with their two young boys (and baby #3 on the way).